Pulverised coal fly-ash and non-returnable glass products have been combined to produce a masonry unit with properties that satisfied the SW (severe weather) rating as outlined in CAN/CSA-A82.1-M87. In addition to the utilisation of two environmentally unfriendly products, energy savings because of low firing temperatures for a short duration contribute towards the attractiveness of the development. 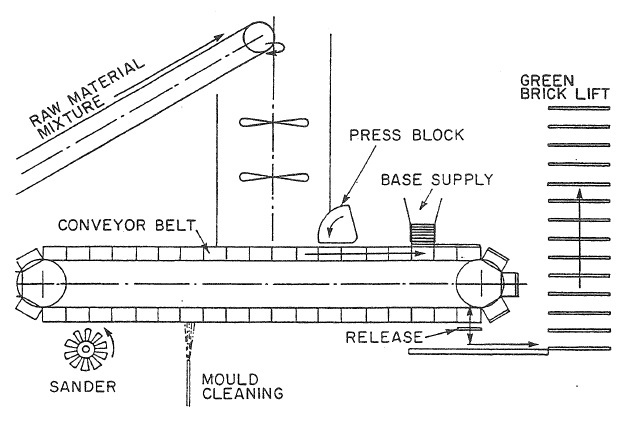 Production of the unit required the dry-press method. Although this method is used extensively in many parts of the world, its application in North America, the United Kingdom and Australia for example is rather limited. In those parts the stiff-mud process is preferred which enables extrusion through a die. This paper includes results obtained to manufacture a fly-ash/glass brick suitable for production with standard stiff-mud equipment by adding a minimal quantity of suitable clay while replacing classified ash with a lower grade bottom ash.